SHK‘s latest shipment of boats arrived this week and I was itching to get down to see the newly arrived range of Boréal Design and Maelstromkayak boats. In particular I was interested in the Vaag, a saucy playboat designed by mad tide-racers our of Quebec, Canada. The Vaag down on the beach. 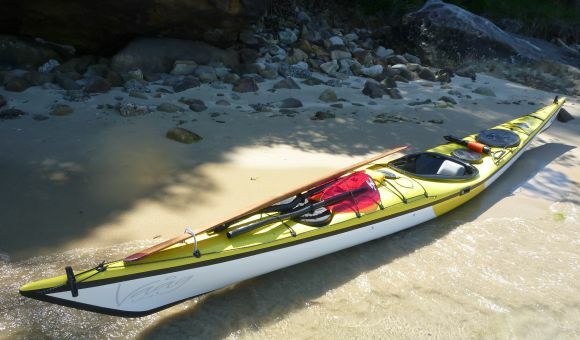 Welcome to Sydney, little Canadian kayak! Sol and I carried the Vaag down the water’s edge where I could get a good look at her sleek lines. 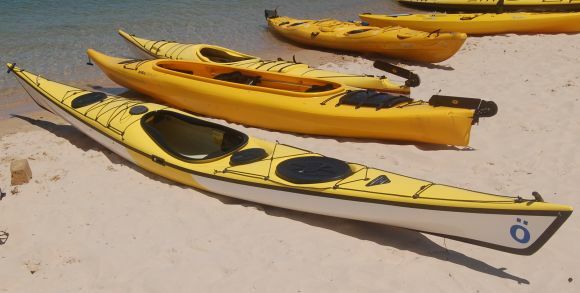 Her design deviates from many of the sea kayaks out there, and I was interested to see what those differences looked like. The first thing I noticed was her cockpit, which has an extended keyhole, a shaped foam cushion and a sloping bulkhead behind the seat with a thick pad on it. The extended keyhole cockpit is great – I thought it would be hard to get into, but in fact this is the first boat I’ve tried where I could sit in the cockpit first and bring my legs in behind me. For this I was extremely impressed. The close bulkhead is great for emptying water out (which I found out later!!) and the design allows Greenland-style paddlers to easily lay back on the rear deck. When paddling I found the seat snug, well-fitting and extremely comfortable, so I was pretty happy with that. 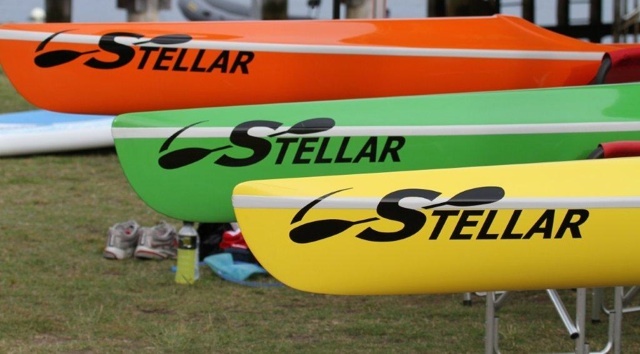 The skeg slider is mounted at hip-level next to the cockpit and is incredibly smooth to operate – far easier and smoother than my own kayak. Note the loop on the front of the bow - great for slipping your Greenland paddle into! The front deck is low and has a hatch for small items. 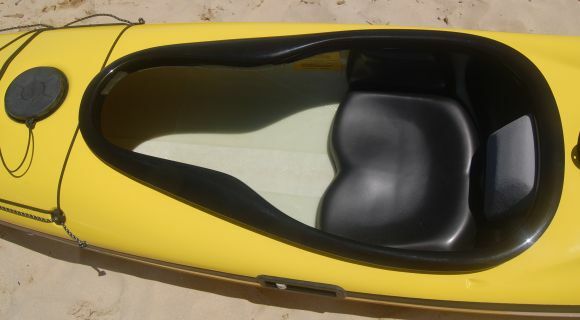 The rear day hatch is different from most other sea kayak set-ups in that it is centred rather than offset to one side. I initially thought this would be a bit of a problem, but in fact it was easy and accessible to get into, and even easier to close than the off-set types, since you can just lean your weight back onto it without upsetting the balance of the boat. Lastly, I noted that the Vaag has an interesting hull shape, quite different from the moderate V hull of my British sea kayak. The hull is quite flat with a distinct curved chine, which looked like it would be sensational surfing down the face of a wave (or I suppose tide-race, if we had any!). I couldn’t wait to get into her and head out into Middle Harbour. The only problem was there was an enormous North-Easterly blowing which was making kayaking extremely difficult, with confused chop mixing with boat wake to create some nasty patches out in the channel. I started using my GP and found the boat to be extremely twitchy in the confused water, making me hesitant to edge it too far in case I fell into the drink. The Vaag tracks straight as an arrow however, and without plenty of edge can be pretty difficult to turn, especially in strong quartering winds. 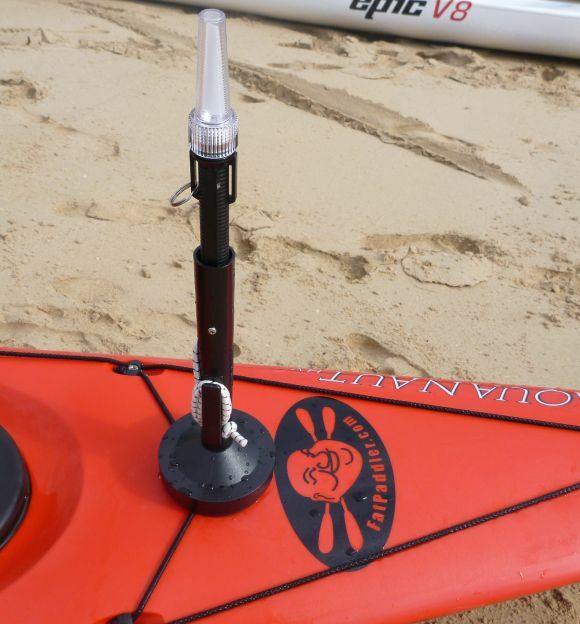 With the twitchiness in the winds making me nervous, I swapped over to my H2O Crystal-X Euro paddle to see if it helped me with bracing. This enabled me to get plenty of speed which helped bed the Vaag down into the water, gaining stability as well as plenty of steam to get on waves. In fact, with the flat bottom of the boat I’d find even the slightest wave behind me would pick the boat up and throw it down its face. Simply, this thing surfs like you wouldn’t believe! However, despite the power the Euro provides, I was still feeling less comfortable than I had with my Adanac GP. 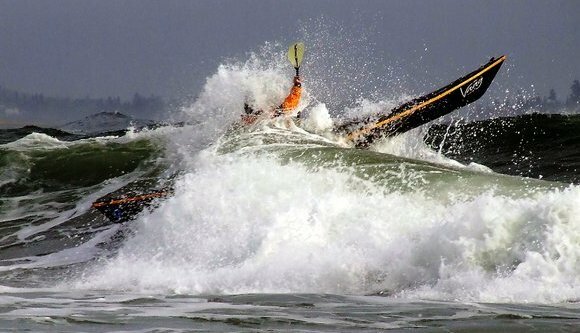 I decided to get out of the wind, find a little beach to pull into, and swap my paddle over. Then as I cruised towards the shoreline, out of nowhere the boat suddenly tipped me out! Funnily enough I didn’t even realise my GoPro camera was running, but it certainly gave me a laugh later when I noticed how good my underwater hat retrieval skills were – haha! Anyway, I got the Vaag into the beach and emptied the water out of the cockpit (made very easy by the rear sloping bulhead) before swapping my paddles over for the return leg. Then I was back out amongst the wind again, bouncing around in the waves but enjoying the great speed the kayak is capable of – even with my stick. The Maelstrom Vaag is a beautiful performance kayak designed for play. For someone of my size (127kg/280lbs) I found the boat a touch small, especially around the legs due to the low front deck. This also means it has a lower volume and I dare say I was sitting pretty low in the water – in fact on many occassions where I had a little edge going I found my paddle hand immersed in water. The boat tracks incredibly well but does need to be pushed right onto edge to turn, making it best left to more experienced paddlers. It felt very twitchy to me in the strong winds, but a lighter paddler with more experience in narrow boats such as Nordkapps or Nadgees would not find this a problem. On waves the Vaag takes off, and for the coastal surfers this boat would be an absolute blast. The fit out is excellent and I particularly liked the entire cockpit design. The keyhole makes entry/exit a breeze (yes, even wet-exits – haha! ), the seat is very firm and comfortable, and I loved the sloping back bulkhead with padding which makes laying back on the deck a breeze (although paddlers who prefer back-bands on their seats may not agree). The skeg control is out of the way and I didnt once knock it with my knuckles, something I seem to do regularly with my Brit skeg boat. Maelstrom Vaag on the beach after having thrown me out. Still beautiful though! I liked the day-hatch set-up although I’ve heard a few people say they don’t like its position. I dare say if the knockers were shown how easy it is to use they may change their tune. 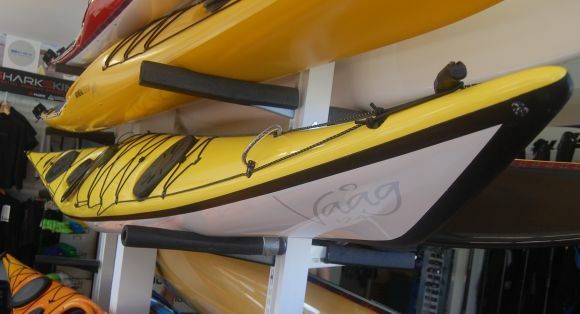 Lastly, the Vaag comes with a paddle loop on its nose which seems made for slipping your Greenland paddle into – a feature which for obvious reasons gets top marks from me!